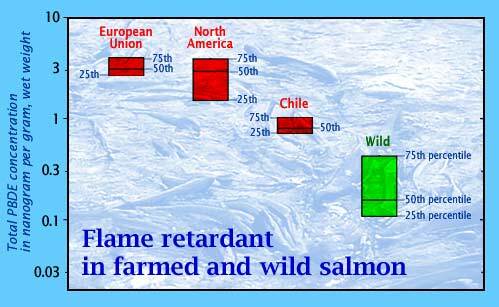 Farmed Atlantic salmon (red), especially from Europe, showed the highest contamination of flame retardant. Five species of Pacific salmon (green) had much lower levels. Data Courtesy Ronald Hites, University of Indiana. Got some salmon on the grill? We wouldn't bet against it. Salmon consumption ballooned 23 percent per year between 1987 and 1999 in the United States, and 14 percent in Europe. A raft of that salmon comes from farms located in North America, Europe and Chile. 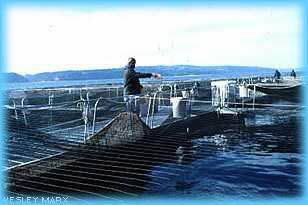 Salmon production at fish farms is up 40-fold over the past 20 years, to more than 1 million tons. 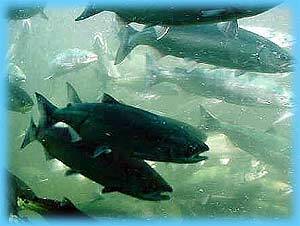 Is farmed salmon more contaminated than wild salmon? The issue surfaced in January, when a group lead by Ronald Hites, a professor of environmental and analytical chemistry at Indiana University, found higher levels of PCBs, dioxins, and breakdown products of some long-banned pesticides in farmed salmon, especially from European farms. Now the same researchers have found higher levels of a flame-retardant called PBDE (polybrominated diphenyl ether) in farmed salmon. These chemicals are persistent organic pollutants (POPs) that dissolve in fat and become more concentrated every time a predator eats prey containing them. As the name implies, these persistent pollutants can last for years or decades in the environment. And while the link between disease and POPs is 30 years old, PBDEs have only recently begun attracting interest. "It's primarily because concentrations have been increasing everywhere in the environment for the last 20 years or more," Hites says. "The concentration is doubling in all parts of the environment every three to five years, in people, fish, birds and seals." PBDEs are used as a flame retardant in polyurethane foam, which is a mainstay in the furniture industry. 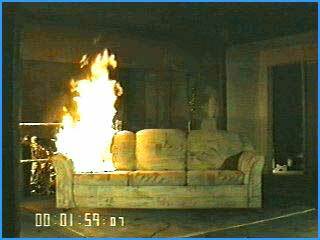 Since foam produces so much heat when it burns, flame retardants have saved hundreds of lives, says Hites. But when factories release PBDE, or foam products break down, that PBDE can concentrate in salmon or other predators. To study POPs in salmon, Hites and his colleagues gathered almost 2 metric tons of samples, or about 700 fish. Farmed Atlantic salmon (Salmon salar) came from farms in Chile, the United States, Canada and Northern Europe. Because Atlantic salmon was not available commercially, the wild fish came from five different species, all from the Pacific Ocean. The scientists had the samples ground into a paste and sent to Canada for precision chemical analysis. European farmed salmon produced the highest level of contamination, while fish from Chile, raised in the Pacific Ocean, had the lowest levels. The differences in PBDE levels presumably reflect the level of PBDE in salmon feed. Salmon are predators, and they select from the fish menu. In practice, this translates to "trash fish," fish too ugly or bony to grace the plate or grill. These fish are netted, ground up and turned into pellets. Local fish dominate the salmon's menu (not because locally-grown products are so trendy, but because they are cheaper to ship). So fish grown in Europe are eating mainly rejects from the eastern North Atlantic. The far purer farmed salmon from Chile would seem to be eating cleaner feed, derived from South Pacific fish, and the fish farmed in Maine apparently devour a product with intermediate levels, Hites says. All of which would be more convincing if the researchers had found significant differences in PBDE levels in feed from the various regions. But the samples didn't show a regional trend: Two of the highest concentrations appeared in feed from British Columbia. Still, Hites avers that the regional differences in farmed salmon contamination are probably "because of the fish the salmon are fed." Those who have followed the long debate about the dangers of other POPs must be wondering about these fire retardants, but the exact toxicity of PBDEs is uncertain at this early stage. However, Hites says they seem to disrupt the endocrine system, and affect cytochrome 450, a group of enzymes that the liver uses to break down toxic chemicals. And while nobody is claiming that putting a farmed salmon on the grill will kill Bill, the surging consumption of farmed salmon portends an increasing exposure. At any rate, says Hites, "the salmon farming industry is well aware of the contamination in fish feed, and is working hard to figure out ways to feed less contaminated feed to salmon." The industry maintains that salmon's benefits outweigh the risks. Pending further research, it says, "the clear benefits of salmon in providing omega-3 fatty acids to the diet, which dramatically improve cardiovascular health, need to be balanced against the very slight exposure to PBDEs," says Keith Ayoob, associate professor of Pediatrics and Certified Nutritionist, Albert Einstein College of Medicine, Bronx, N.Y. 'We definitely know that salmon is a heart healthy food and one that people like and is affordable. I absolutely continue to advise my patients to routinely eat salmon.'" While the contamination levels in farmed salmon are measured in the low parts per billion, and are below Food and Drug Administration guidelines, they are closer to the more recent, and far more stringent, standards of the Environmental Protection Agency. The long history of PCB and DDT contamination offers some lessons about dealing with POPs. When a compound that concentrates in animal tissue lasts for many years in the environment, the best defense is a good defense: Taking the compound off the market. Many years after being banned, levels of such POPs as PCB and DDT continue to drop in the Great Lakes, says Hites. "There is no question that levels of all these old chlorinated pesticides that have been banned have decreased slowly since the bans. That's why everybody is so interested in brominated ethers. While levels of the older [POPs] are going down, these have been coming up." The first restriction on PBDEs occurs this year, with a ban by the European Union. While the U.S. government has not acted, California will ban them in 2008. And one of the three PDBE manufacturers has already suspended production, Hites says. 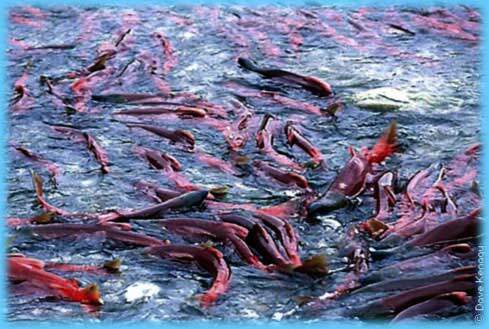 Global Assessment of Polybrominated Diphenyl Ethers in Farmed and Wild Salmon, Ronald Hites et al, Environmental Science and Technology, Aug. 10, online edition. Global Assessment of Organic Contaminants in Farmed Salmon, Ronald Hites et al, Science, 9 Jan. 2004.